If you are suffering with any aches or pains that won’t go away, come along for a consultation and our professional therapists will try to work out why your body isn’t healing as quickly as it might. Maybe there is a joint problem that needs to be addressed, or tight muscles keeping a joint out of neutral alignment? Lots of problems can result from abnormal nerve function, which can be triggered when the joints in the back aren’t functioning properly. 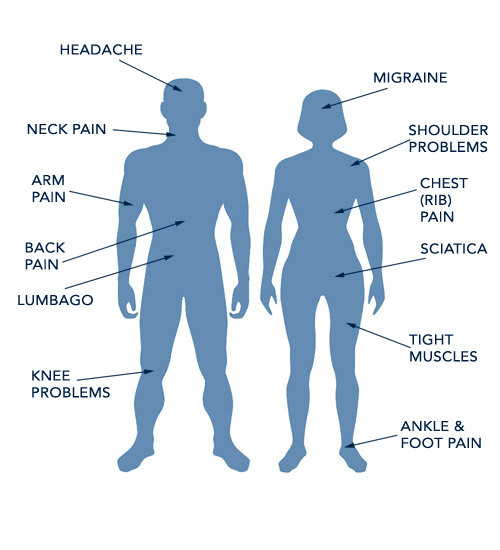 After a consultation and examination one of our therapists will tell you what issues might be causing your pain and ways to change this - by improving joint movement, reducing muscle spasm, helping to restore normal circulation and nerve function, or by dampening down pain signals to allow you to get moving again. You may also be given exercises, postural advice and dietary information to help your body get back in balance. Lots of musculo-skeletal disorders will resolve themselves, given time, but sometimes manual therapy is the best way to speed that process up. Just masking symptoms (e.g. by getting pain medication from a doctor) won’t necessarily resolve the issue, and long-term use of opiod or non-steroidal anti-inflammatory drugs can cause serious side effects. Advice about Back Pain and what to do about it. Understanding chronic or persistent pain.